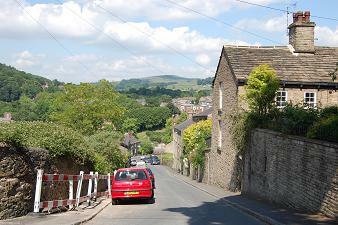 Many of the roads in Bollington which have steep parts have had the word ‘Brow’ in their names at some time or other – examples are Shrigley Brow (the lower part of Shrigley Road up to Beeston Mount), Clarence Brow (Clarence Road), Red Lion Brow (top of High Street, from Water Street up), Defiance Brow (the high end of Queen Street from Defiance Mill up to Heathcote’s), Lodge Brow is beyond the end of Adlington Road, the first part of Sugar Lane, School Brow is the lower part of Hurst Lane. Ovenhouse Brow is one that I have never heard mention of in Bollington but it is marked on a 19thC Tithe map. It is the steep part of Henshall Road from Ashbrook Road up to the junction with South West Avenue. Adshead’s Barn Brow (pictured) is the top piece of Lord Street, so called in the 1851 census, but the name refers to the house at the top on the corner of Cow Lane (but see Adshead Court). Jackson’s Brow is in Spuley Lane, Pott Shrigley, just to the north of the Harrop river bridge. Moss Brow is today the name of the entire lane from Bollington Road to Albert Road, but would originally have referred only to the steep bit, the rest of it being part of Moss Lane. Today the latter is restricted to the length round the corner, a separate almost level street. Beeston Brow and Smithy Brow have also both retained Brow in their names today.